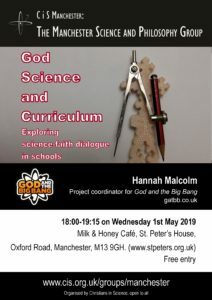 CiS Manchester: The Manchester Science and Philosophy Group aims to provide an opportunity for those in and around the Manchester area to discuss science and faith in a relaxed and informal atmosphere. Each meeting will have a short talk followed by plenty of time for questions and discussion over refreshments. All these events are free, and you don’t need to book, but do put them in your diaries! For more details please e-mail the secretary at sec.cismanchester@yahoo.co.uk. 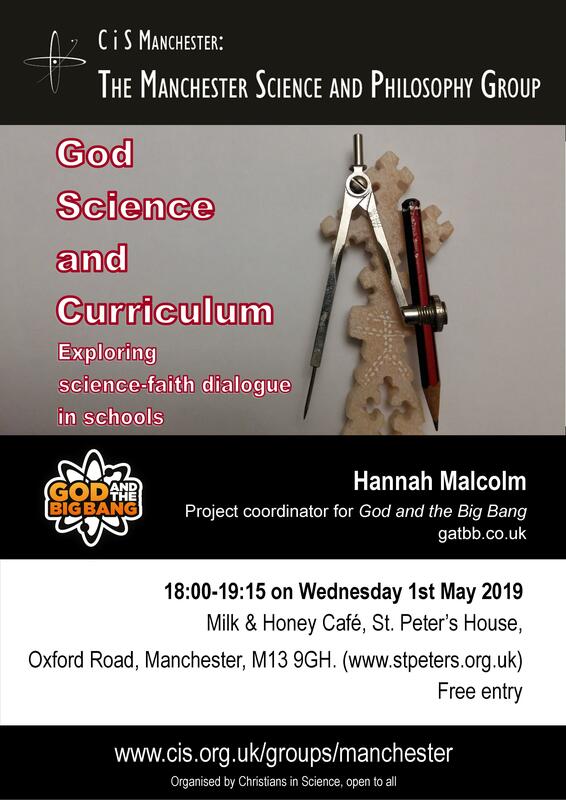 The speaker is Hannah Malcolm, Project Coordinator for the “God and the Big Bang” project, who “likes encouraging young people to ask hard questions”! Her title is “God Science and Curriculum” and she will be exploring science-faith dialogue in schools. Hannah recently won the first “Theology Slam” competition, and it should be a fascinating evening. Location: Milk & Honey cafe in St Peter’s House, Oxford Road, Manchester M13 9GH. Entry is free and refreshments will be available to purchase from the cafe. To download slides from previous talks please click here.